Jim Henson’s puppet creations, known as Muppets, had been on television throughout the 1960s and early 1970s on variety shows, specials and Sesame Street before they finally got their own show in 1976. The result was something familiar and yet very different—a variety show full of wit and whimsy, goofiness and artistry. Adding to the various Muppet Show collections already available on DVD, Disney has released the complete first season of the show. The extra features are a little sparse, but for Muppet fans, the set is worth a look. 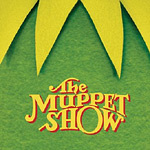 The show’s format had the Muppets putting on a vaudeville show on a stage, for a puppet audience. Kermit the Frog (operated and voiced by Henson) was in charge both on and off stage and surrounded by cast of thousands. The more prominent supporting characters included Fozzie Bear, wannabe comedian; Miss Piggy, the diva madly in love with “Kermie;” Gonzo the Great, best known for his bizarre acts; and Statler and Waldorf, the elderly hecklers in the box seats. Each show also featured a human guest star. Season one has Rita Moreno, Jim Nabors, Florence Henderson, Ben Vereen and Peter Ustinov, to name a few. The variety show format gave Henson and his fellow puppeteers a chance to try many different things. For all of the sketches with silly one-liners, there are more mixed in that show a great deal of creativity. One sequence has two creatures made from vacuum cleaner tubes bopping to a peppy song. Another number has Marvin Suggs and his Muppephones, little round-headed creatures who say “ow” in different keys when hit in the head with a mallet. And there was always room for big production numbers—like a delightful version of There’s No Business Like Show Business that has Ethel Merman singing with the Muppets. Every episode has Muppet Morsels, pop-up trivia, which can be turned on or off as desired. It features tidbits about the production of the show, the careers of guest stars and more. Some of the factoids are interesting. In episode one, the trivia points out a moment where the head of a puppeteer is visible. We also learn why Miss Piggy’s voice changed from scene to scene in the early episodes. Other morsels, offering information about song lyrics, are irrelevant and distracting. What’s missing from this set is a behind-the-scenes documentary, for those fans who would prefer not to watch all the trivia to learn about the making of the show. Aside from the trivia, the rest of the features are on the fourth disc. A humorous pitch reel features a Muppet in a suit and tie invoking God, the American flag and anything else he can come up with to convince network executives to produce the show. The picture quality is excellent, with a crispness superior to broadcast television. The sound is good too, though unremarkable, since the show was produced before the era of stereo television The back of the box tells us that all of the episodes have been restored and remastered, though provides no information as to how this was done. It’s worth noting that the episodes on this DVD are longer than what was originally shown on American television. The show was produced in London for and broadcast in both the U.K. and U.S. Episodes that were trimmed for U.S. broadcasts (presumably to allow for more commercials) are presented in their entirety on this set.